Last month, I wrote about Costco's efforts to attract the kosher consumer by increasing their selection of kosher products, including kosher chicken and kosher meat. They certainly had the best of intentions even if the samples of cooked kosher chicken they were handing out wouldn't pass even the most lenient of kosher standards. Now, one of the local Costco warehouses in Michigan is reaching out to synagogue leaders to have Costco's kosher products publicized to synagogue members before Passover. 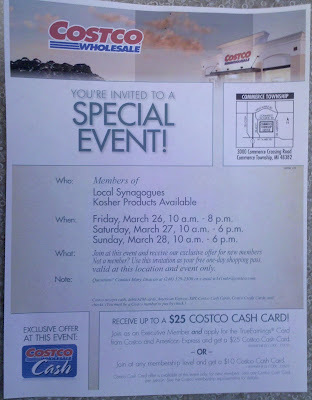 Unfortunately, once again, it looks like Costco didn't consult anyone in the Jewish community who would have likely informed Costco's public relations department not to have their special event take place on Shabbat. Oops! There are other times for kosher consumers to attend this special three-day event, but most Jewish people will have already completed their Passover shopping at this point. Well, at least the thought is there. kosher in general to warrant a special event. There is also no small section devoted to the kosher consumer. Chicken and tray of Manischewitz white macaroons. After the last time I commented in regards to COSTCO and its kosher merchandizing, I think it best not to comment on this one.